Want to see your byline in national women's magazines? Join the club. I started out writing for women's magazines like Fitness, Shape, Woman's Day, Family Circle, Cosmopolitan, and Self, and over the years, I've helped dozens of freelancers crack these sought-after markets. Yet writing for women's magazines has its own challenges, too. 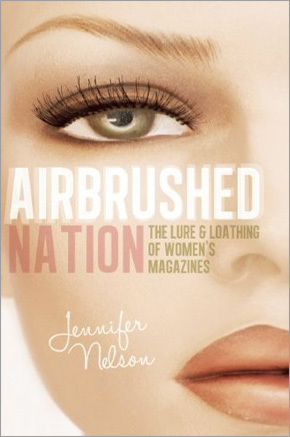 That's one reason I was so excited to interview Jennifer Nelson, a fellow women's mag vet and author of the just-released Airbrushed Nation: The Lure and Loathing of Women's Magazines. This post--and her book--are must-reads if you want to write for the big women's mags. Q: Jennifer, you've written for a slew of women's magazines over the years. What's your best advice for freelancers who want to crack this lucrative market? A: Well, it still starts with a great idea no matter what type of magazine or publication you are pitching. Make sure it’s an idea the magazine would run. If they never cover such a topic, they aren’t likely to make your idea a first. Make sure it isn’t a topic that’s been covered recently--do your homework. And tweak the packaging to the magazine’s specifications: If they run 500-word stories based on a study and then include a half dozen tips of service or advice, structure your idea similarly. Go the extra mile. Offer art, charts, sidebar ideas, include a cover line and subtitle: the more work you’ve brought to the table, the more the editor may be interested in the idea--and the less work for her to do. Q: I too have written for women's mags and I always hear the word "fresh," as in "we're looking for a fresh approach to this topic." How can writers take evergreen ideas and give them a fresh spin? A: Editors have been telling writers they need something “fresh” since time immortal—or so it seems. Translation: The women’s magazines run very similar articles month in and month out. There’s a dieting story, there’s a beauty story, maybe there’s some sort of parenting idea in each issue. What’s meant by fresh is that we need the same old, same old ideas only packaged and tweaked in a way that makes it seem like we haven’t seen it before. It’s a huge challenge. I just recently mentioned in another interview that Family Circle ran a ‘walk off the weight’ piece each month for many years. Month in and month out they had to come up with a new and yes, fresh way, to making walking exciting and original: Walk with weights, walk on inclines, walk on varied terrain, walk using speed intervals. After a while it was like how much more can you say about walking, right? Q: Great advice, and great examples--and I too have written multiple pieces on walking off the weight! So tell me what a great query for a women's magazine should include. A: For me, the standard meant I opened with a compelling hook and explained my idea in a nutshell—two to three graphs tops. Within that I might cite the study that applied, quote a potential source or someone in the know, provide some extras like side box ideas, charts, quizzes or a graphic suggestion. I might mention why I am the best writer to tackle the topic—especially if I have some experience with it: I teach yoga and the idea is about yoga; I have two kids and the article is about some parenting aspect. Any personal knowledge or advantage over say, a staff writer or another freelancer can propel you to the top of the assignment list. And finally, I’d wrap up with a list of my credentials and a few of the publications I’ve written for (the more similar to the magazine being pitched, the better), along with some clips. Q: What about new writers? How can they get their foot in the door with a woman's magazine? A: It’s still all about the idea here. Yes, if you have a few major mag clips under your belt, you’re likely to be considered more closely. However, that said, these days with all kinds of Web sites running similar health, food, lifestyle and parenting content as the women’s magazines, a few great Web clips and a great idea can set you up for success. Once upon a time, before I had any women’s magazine clips—or many clips at all for that matter, I pitched an idea to Woman’s Day back in the day when you actually mailed the idea through the Postal Service. The query was well written, addressed to the right editor, and I made a case for myself as the best writer to write the piece. The editor called me three days later when she apparently opened my query letter. I was a newbie but someone took a chance on my idea and my writing. That’s all that’s needed: The right idea written phenomenally and pitched to the right person. It may sometimes sound like the stars have to be aligned in order for it to happen, but that’s not necessarily the case. As always, pitch front of the book or shorter articles since editors will likely be more apt to take a shot on a new writer with a smaller piece than with a 2000-word feature. Do your due diligence so you know what they are running, what they like, how they operate. Once you get a few rejections based on them already assigning something similar or the idea being too close to another story they have in the works, things get even juicier: you know you are on the right track and should keep plugging away at pitching until you land something—or they assign you something, rewarding your many previous efforts. It can and does happen. Q: Tell me about your new book, Airbrushed Nation. Why will freelancers who want to write for women's magazines want to read it? A: Well, the book is for all women who love or hate the women’s glossies, but it’s definitely an especially interesting read for writers—those who have or want to write for women’s magazines. It’s certainly eye opening in the fact that in all of a writer’s study and analysis of the writing in these magazines, it’s easy to overlook some of the negative messaging being brandied about. First of all, most of the images are airbrushed, which sends such a negative message to the young women who are actually comparing themselves to women who don’t even look that way in real life. What’s more, women’s magazines approach their readers as though they must improve something about themselves. In an effort to provide “service” or advice, these magazines begin every topic from the premise that obviously women aren’t good enough as is, beautiful enough, young enough, sexual enough, thin enough and every article purports to “help” them improve. Frankly, knowing that can help you understand how to approach article ideas for these magazines. But sadly, it also sets women up for a culture of never measuring up, comparing themselves to the too thin, too perfect, airbrushed images they see all the while reading about how to dress younger, look younger, act younger at work, diet better, exercise more effectively, please their man better and get a better job, or a better boyfriend, in essence, a better life. Women’s magazines perpetuate the notion that a woman’s life isn’t okay as it is and they can provide a path to improve it through their content. Women’s magazine writers can really use that information when crafting story ideas—just knowing that the women’s magazines are all about improvement and advice can help ensure that the ideas writers come up with have some element of that. Unfortunately, research shows that premise can have seriously negative effects on a woman’s body image, self esteem and sense of self worth, not to mention it may set them up for depression, eating disorders, and other body issue disorders and is especially troubling for young girls and women who are more impressionable or already have self esteem issues. Other areas of the book from the fashion to the celebrity information to the advertising truths will offer unfettered knowledge for the women’s magazine writer going forward. If you know and understand what the women’s magazines are doing and thinking, it’s easier to become a cog in their wheel. On the other hand, some of the more disingenuous practices such as shallow celebrity interviews or a youth-inizing focus can be turned upside down to help writers create the more substantial content for other glossies like men’s and general interest magazines. Overall, having a thorough understanding of women’s magazines can only improve women’s magazine writers as people, and wordsmiths creating content anywhere. For women writers especially, it may be an eye opening read to understand the inner workings of their favorite glossies. **My thanks to Jennifer for this interview, and for writing such a well-researched, thought-provoking book. I highly recommend it for readers and writers both. This was a great read. While Im not exactly a new freelancer, I'm still not where I want to be. It really is encouraging to know that once you start getting rejections because it's something they've seen before means there is hope. Thanks for your comment, and I agree. I had multiple queries to markets like Woman's Day get rejected before I broke in there, and with other markets too. Great interview. Jennifer is so accomplished (and nice too!) I'm very happy for her success. Cheers! Thanks for the great interview, Kelly and Jennifer. I appreciate the insights you've shared, Jennifer, regarding women's magazines. I do not, nor will I ever, pitch to them just for the reason that I do not like the image that you have described. I would rather stick to my values and make less money than support something that I wouldn't bring into my home. I'll stick with the gardening/farming magazines.